Introduction : Reflection and reflective practice is of increasing importance in medical education curricula. The aim of this review is to summarise the literature published around facilitating reflection in a medical course, and to answer the question : W0 hat is the current evidence regarding learning and development moments across the medical curriculum in developing students' reflective practice? Methods : A review of the literature was undertaken using defined databases and the search terms 'medical students', 'medical education', 'reflection', 'reflect*' and 'medicine'. The search was limited to peer-reviewed published material in English and between the years 2001 and 2011, and included research, reviews and opinion pieces. Results : Thirty-six relevant articles were found, identifying enhancing factors and barriers to effectively teaching reflective practice within medical curricula, relating to: The breadth of the meaning of reflection; facilitating reflection by medical educators; using written or web-based portfolios to facilitate reflection; and assessing the reflective work of students. Discussion : A variety of reflective purposes was found in this literature review. Evidence indicates that, if students are unclear as to the purpose of reflection and do not see educators modelling reflective behaviours, they are likely to undervalue this important skill regardless of the associated learning and development opportunities embedded in the curriculum. What is the current evidence regarding learning and development moments across the medical curriculum in developing students' reflective practice? The literature search was undertaken using the online databases of CINAHL and Medline. Keyword searching was conducted using MeSH headings, Boolean operators, and the terms, 'medical students', 'medical education', 'reflection', 'reflect*' and 'medicine'. The search was limited to peer-reviewed published material in English and between the years 2001 and 2011 to maintain currency of practice. The primary search yielded 129 references of eligible papers, including research papers, reviews, formal reviews and opinion pieces. Abstracts were read by the first author, and only articles pertaining to facilitating or teaching reflection in undergraduate or postgraduate medical courses were included. The first author read and classed all included articles, categorising them into construct sub-categories. At several stages in this process all authors reviewed the validity and legitimacy of the classifications. This led to the sub-headings and analysis presented below. Thirty-six relevant articles were found. 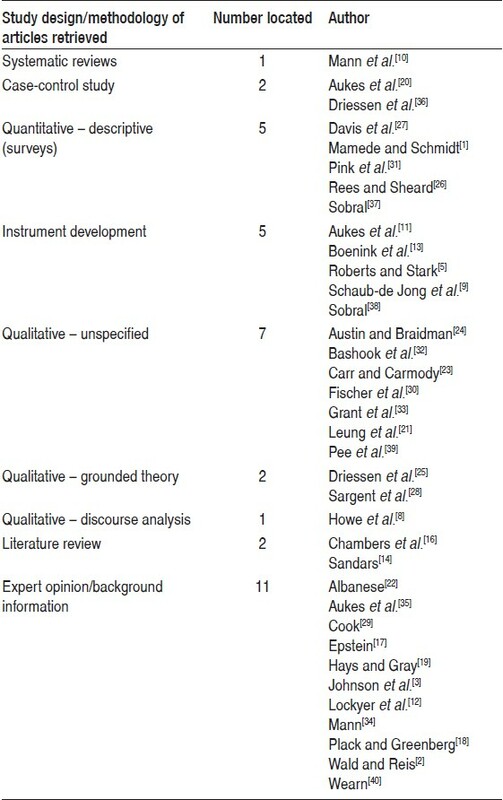 These articles were classified by methodology (see [Table 1]. Relevant references identified). As can be seen in [Table 1], this review included many opinion pieces, reviews and descriptions of methods of facilitating reflection, but little in regards to primary data in the area. Qualitative methodology was the main research output, providing largely descriptive data of the facilitation of reflection. The quantitative research was also largely descriptive, with survey methodology being the most popular in the articles found. This review found only two case-control studies comparing facilitation methods of reflection. Assessing the reflective work of students. Each will be explored in turn. The term 'reflection' is widely mentioned within medical education literature, but the purposes and goals described indicate a breadth of purposes of reflection. Mann et al. concluded from their systematic review of reflective practice in the health professions that the nature of reflection makes it difficult to quantify. From this current review, we determined that the breadth of reflection covers the purposes of reflecting to improve judgements, to personally develop and, and to contextualise practice, and are explained in [Table 2]. Reflection to improve judgement centres on improving students' clinical skills, problem solving,  flexible thinking, lifelong learning and the development of expertise. ,,, Reflection for this purpose usually has a problem focus, involves critical thinking, and is commonly indicated by hypothesis testing. Reflection to personally develop is essential in client-centred practice, as doctors need to consider they own values and assumptions, and those of the patient, while making clinical decisions. From reviewing the literature, Sandars  asserted that the knowledge of one's values and beliefs is important for a doctor to develop therapeutic relationships with patients, as understanding oneself enables empathy and caring. Aukes et al. reviewed literature in preparation for creating an assessment tool for reflection, and noted that personal reflection has often been overlooked in medical education. They suggested that this has occurred as personal development and has been seen as outside the domain of the problem-solving culture of medical practice, and thus, outside the domain of medical education. Reflection to contextualise practice helps students integrate theory with their own experience. Several authors have hypothesised that this aspect of reflection is essential in developing a sound medical practice,  with a lack of reflective ability resulting in poor self-awareness, and thus poor medical practice. Howe et al. found, from their study of the development of professionalism, that reflecting on practice and developing self-awareness are important mechanisms of resilience in the face of a demanding profession. Although this breadth of reflective practice makes it an essential skill in medical practice, this very strength can also be a barrier in teaching facilitating reflective practice as there is often ambiguity of the educator's goals in regard to the use of a particular reflective task. , Aukes et al. noted that purposes of a reflective tasks were rarely articulated, and students were often unaware of the perspective, reflective purpose or role, they were expected to take. Sanders  concluded from a literature review of reflection in medical education that, for students to reflect effectively, they required clarity in determining the appropriate purpose of a reflective task. Reflection is often provoked by uncertainty or unease resulting from an experience. , According to Albanese,  in addition to this uncertainty or unease, a student requires knowledge of how to reflect, and time and motivation for reflection to occur. Supporting this opinion, Carr and Carmody  found in their qualitative study that some students could attain an acceptable level of reflection independently. However, reflection was greatly enhanced through medical educators' facilitation. Medical educators' facilitation was found to be useful for reflection in one-on-one meetings with students and in small group tutorials. , According to results of a study by Schaub-de Jong et al.,  educators who wished to encourage reflection needed to model reflective practice by making their experiences more explicit, investigating emotions and stimulating interaction among students. Albanese  suggested that medical faculty staff should be trained to articulate their reflections to enhance modelling to students. Portfolios are highly valued by educators,  however, explorations of students' views indicated a range of opinions as to their value. Davis et al. reported on UK medical students' feedback, indicating that students perceived portfolios to assist in their ability to reflect. Also in the UK, Rees and Sheard  surveyed 178 second-year medical students regarding their views about a reflective portfolio assessment, using the reflective portfolio questionnaire (RPQ). They found a significant relationship between the RPQ scores and students' rating of their reflection skills, students' confidence in building another portfolio, and students' marks for their portfolio assessment. This suggests that students with more positive views about portfolios were more likely to rate their reflection skills as good, be more confident in building a portfolio and receive better marks for their portfolio. Driessen et al. interviewed portfolio mentors of undergraduate medical students in The Netherlands regarding conditions for reflection via portfolios. Participants determined that the following four conditions needed to be met to encourage reflection: coaching; portfolio structure and guidelines; experience and materials; and summative assessment. The mentors' role of coaching involved showing students what questions to ask themselves when reflecting, helping students to identify their own learning needs and motivating students to reflect, often by explaining the value of reflection. Portfolio structure and guidelines needed to clearly explain to students what was expected. Participants reported that a more open structure was useful once students had learnt to reflect, and too much structure may be an obstacle for students with good reflective skills. The importance of a variety of interesting reflective subjects was articulated by participants in the theme experiences and material. Finally, the theme of summative assessment described some difficulty in providing the right amount of focus on assessment. The participants indicated that portfolios needed to be part of an assessment in order for them to be taken seriously by the students, but the assessment criteria needed to be sufficiently flexible to allow for individual reflective styles. Sargeant et al. conducted focus groups to explore medical students' perceptions of self-assessment, with students reporting a range of views on the use of portfolios. Some students reported portfolios had little benefit. Many suggested they were, at best, a record of performance over time. For a smaller number, the use of portfolios stimulated reflection about specific incidents and progress, and the act of writing stimulated a deeper level of reflection. The authors reported that the level of importance that students placed on portfolios was diminished if supervisors did not understand the value of this reflective tool. Traditionally, reflective tasks have been paper based. Recently, web-based methods and social media have been adopted to facilitate reflective skills. Cook  asserted that there has been little study of the efficacy of these methods. Fischer et al. compared content, depth of reflection and student preference for web-based versus traditional essay-style reflections in two medical schools in the USA. Ninety-five students were quasi-randomly assigned to one of two study groups, where one group wrote a traditional reflective essay and attended a small-group discussion, while the other group posted two writings in a group blog and commented on a peer's post. The writings were coded for theme, and level of reflection, with the authors finding no difference between groups for either variable. Student opinion of e-portfolios was sought by Pink et al.,  who developed an e-portfolio system for final year medical students at the University of Cardiff. They reported that 87% of respondents agreed that e-portfolios improved their engagement in reflective learning. Teaching staff opinion has been sought by Bashook et al.,  who surveyed eight teaching staff from the University of Illinois, and qualitatively coded their responses. Participants reported that students' responses of reflective questions via e-portfolios gave them greater insight than other methods of reflection into students' thinking and reflective ability. Fish and de Cossart identified nine elements of practice that characterised the experience of working doctors in the UK, and they asserted, should be included in all post-graduate medical courses. These elements included some related to the context of practice, the doctor's personal qualities and values as an influence in shaping practice, and professional judgement, all of which could be addressed by reflective practice. They suggested that there was no concrete way to formally assess the criteria of reflexivity, nor many of the criteria which rely on individual's values. However, the literature suggests that a challenge in facilitating reflection appears to be the fine balance between encouraging voluntary reflections and that of assessing reflective work as a means to ensure it is undertaken. Grant et al. studied the effects of voluntary involvement in reflective learning strategies on student learning. Around 10% of third year undergraduate students engaged in the voluntary program of fortnightly tutorials and ongoing learning journals. The students involved in the reflective learning perceived that they had an improved ability to integrate learning from various sources. The students who did not take part reported that the factual content of the course made reflective learning less useful. There was no difference in examination results between these two groups. The authors concluded that the students appeared unlikely to voluntarily engage in reflection if they did not think it was linked to the curriculum or assessment. Albanese  noted that surviving a medical education was often a daunting process. Students were often task-focussed, with little time for reflection. Given that adequate time and motivation are required to instigate reflection, it is not surprising that voluntary reflection is unlikely to occur in the medical student population. , However, the very nature of assessing a reflective task may decrease the effectiveness of the task. In Sargeant et al. study of medical students' perception of self-assessment, students reported that formal assessment and external scrutiny of the portfolios diminished the personal reflexivity, and subsequent learning value of this method of reflection. Several authors noted that reflection was an essential skill in medical practice, ,,,,, and advocated for training in reflective processes. , Training in reflective practice can be significantly enhanced with the facilitation of skilled mentors, providing guidance and modelling of reflective behaviours, as found by Carr and Carmody. Several studies and literature reviews report inconsistencies regarding the purpose of reflection, which was found to be a significant barrier to the facilitation of reflective practice. ,,, The implication for educators is that students need to be given clear guidelines as to the purpose for each individual reflective task. Traditionally, paper-based methods of reflection have been popular with educators, ,, but recently, web-based methods have been adopted. Driessen et al. found that the method of reflection appears to be less important than the guidelines provided, which should be structured initially, and become more fluid as students' reflective skills progress. Ideally, students should be able to revisit and edit the reflection, hence web-based methods may be suitable for this purpose. It is apparent from this review that the research surrounding the teaching and facilitation of reflection is generally weak. Although there are some descriptive data, there is very little empirical evidence of the efficacy of facilitation methods. Additionally, there is a lack of rigorous research investigating the impact of reflection on practice skills or patient outcomes. A major limitation of literature is the breadth of the construct of reflection. A more defined construct of reflection, with clear outcomes, could lead to the development of benchmarks useful in tracking student progress and as research outcome measures. Most authors cited in this review suggested that the emphasis on reflection is increasing in medical curricula. The construct of reflection was broad in the reviewed literature. This suggests that medical educators must be clear on the purpose of reflection, the intended outcome for the individual student and the process necessary to achieve these aims for students. Evidence indicated that, if students are unclear as to the purpose of reflection and do not see educators modelling reflective behaviours, they are likely to undervalue this skill regardless of the associated learning and development opportunities embedded in the curriculum. 1. Mamede S, Schmidt HG. The structure of reflective practice in medicine. Med Educ 2004;38:1302-8. 2. Wald HS, Reis SP. Beyond the margins: Reflective writing and development of reflective capacity in medical education. J Gen Intern Med 2010;25:746-9. 3. Johnson C, Bird J. How to …: Teach reflective practice. Educ Prim Care 2006;17:640-2. 4. Boud D, Keogh R, Walker D. Reflection: Turning Experience into Learning. London, UK: Kogan Page; 1985. 5. Roberts C, Stark P. Readiness for self-directed change in professional behaviours: Factorial validation of the Self-Reflection and Insight Scale. Med Educ 2008;42:1054-63. 6. Schön DA. Educating the Reflective Practitioner. San Francisco, CA: Jossey-Bass; 1987. 7. Fish D, de Cossart L. Developing the Wise Doctor. A Resource for Trainers and Trainees in MMC. London, UK: Royal Society of Medicine Press Ltd.; 2007. 8. Howe A, Barrett A, Leinster S. How medical students demonstrate their professionalism when reflecting on experience. Med Educ 2009;43:942-51. 9. Schaub-de Jong MA, Schönrock-Adema J, Dekker H, Verkerk M, Cohen-Schotanus J. Development of a student rating scale to evaluate teachers' competencies for facilitating reflective learning. Med Educ 2011;45:155-65. 10. Mann K, Gordon J, MacLeod A. Reflection and reflective practice in health professions education: A systematic review. Adv Health Sci Educ Theory Pract 2009;14:595-621. 11. Aukes LC, Geertsma J, Cohen-Schotanus J, Zwierstra RP, Slaets JP. The development of a scale to measure personal reflection in medical practice and education. Med Teach 2007;29:177-82. 12. Lockyer J, Gondocz ST, Thivierge RL. Knowledge translation: The role and place of practice reflection. J Contin Educ Health Prof 2004;24:50-6. 13. Boenink AD, Oderwald AK, De Jonge P, Van Tilburg W, Smal JA. Assessing student reflection in medical practice. The development of an observer-rated instrument: Reliability, validity and initial experiences. Med Educ 2004;38:368-77. 14. Sandars J. The use of reflection in medical education: AMEE Guide No. 44. Med Teach 2009;31:685-95. 15. Ewen SC. Unequal treatment: The possibilities of and need for indigenous parrhesiastes in Australian medical education. J Immigr Minor Health 2011;13:609-15. 16. Chambers S, Brosnan C, Hassell A. Introducing medical students to reflective practice. Educ Prim Care 2011;22:100-5. 17. Epstein RM. Reflection, perception and the acquisition of wisdom. Med Educ 2008;42:1048-50. 18. Plack MM, Greenberg L. The reflective practitioner: Reaching for excellence in practice. Pediatrics 2005;116:1546-52. 19. Hays R, Gay S. Reflection or 'pre-reflection': What are we actually measuring in reflective practice? Med Educ 2011;45:116-8. 20. Aukes LC, Geertsma J, Cohen-Schotanus J, Zwierstra RP, Slaets JP. The effect of enhanced experiential learning on the personal reflection of undergraduate medical students. Med Educ Online 2008;13:15. 21. Leung KH, Pluye P, Grad R, Weston C. A reflective learning framework to evaluate CME effects on practice reflection. J ContinEduc Health Prof 2010;30:78-88. 22. Albanese MA. Crafting the reflective lifelong learner: Why, what and how. Med Educ 2006;40:288-90. 23. Carr S, Carmody D. Experiential learning in women's health: Medical student reflections. Med Educ 2006;40:768-74. 24. Austin C, Braidman I. Support for portfolio in the initial years of the undergraduate medical school curriculum: What do the tutors think? Med Teach 2008;30:265-71. 25. Driessen EW, van Tartwijk J, Overeem K, Vermunt JD, van der Vleuten CP. Conditions for successful reflective use of portfolios in undergraduate medical education. Med Educ 2005;39:1230-5. 26. Rees C, Sheard C. Undergraduate medical students' views about a reflective portfolio assessment of their communication skills learning. Med Educ 2004;38:125-8. 27. Davis MH, Ponnamperuma GG, Ker JS. Student perceptions of a portfolio assessment process. Med Educ 2009;43:89-98. 28. Sargeant J, Eva KW, Armson H, Chesluk B, Dornan T, Holmboe E, et al. Features of assessment learners use to make informed self-assessments of clinical performance. Med Educ 2011;45:636-47. 29. Cook DA. The research we still are not doing: An agenda for the study of computer-based learning. Acad Med 2005;80:541-8. 30. Fischer MA, Haley HL, Saarinen CL, Chretien KC. Comparison of blogged and written reflections in two medicine clerkships. Med Educ 2011;45:166-75. 31. Pink J, Cadbury N, Stanton N. Enhancing student reflection: The development of an e-portfolio. Med Educ 2008;42:1132-3. 32. Bashook PG, Gelula MH, Joshi M, Sandlow LJ. Impact of student reflective e-portfolio on medical student advisors. Teach Learn Med 2008;20:26-30. 33. Grant A, Kinnersley P, Metcalf E, Pill R, Houston H. Students' views of reflective learning techniques: An efficacy study at a UK medical school. Med Educ 2006;40:379-88. 34. Mann KV. Reflection: Understanding its influence on practice. Med Educ 2008;42:449-51. 35. Aukes LC, Cohen-Schotanus J, Zwierstra RP, Slaets JP. The float model: Visualizing personal reflection in healthcare. Educ Health (Abingdon) 2009;22:210. 36. Driessen EW, Muijtjens AM, van Tartwijk J, van der Vleuten CP. Web-or paper-based portfolios: Is there a difference? Med Educ 2007;41:1067-73. 37. Sobral DT. Medical students' reflection in learning in relation to approaches to study and academic achievement. Med Teach 2001;23:508-513. 38. Sobral DT. Medical students' mindset for reflective learning: A revalidation study of the reflection-in-learning scale. Adv Health SciEduc Theory Pract 2005;10:303-14. 39. Pee B, Woodman T, Fry H, Davenport ES. Appraising and assessing reflection in students' writing on a structured worksheet. Med Educ 2002;36:575-85. 40. Wearn A. Reflecting on 'reflection' and 'reflex'. Med Educ 2011;45:431.